Stewart Sinclair farmer of Mid Clyth died 24th January 1898 aged 74. Wife Ann Sutherland died 31st August 1905 aged 77. 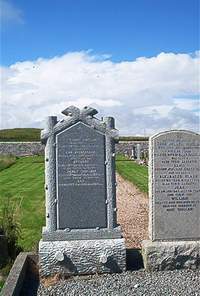 Son Stewart Sinclair died 27th September 1891 aged 23. Daughter Janet Sutherland Sinclair died 30th March 1936 aged 73. Daughter Ann Sinclair died 20th June 1960 aged 94.